So there’s a huge debate on ab african pre Colombian contact . 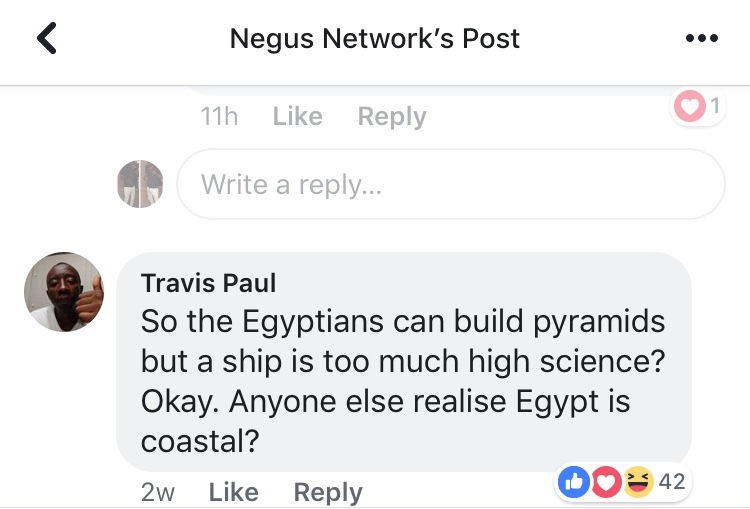 one commenter in a video on this subject stated "So the Egyptians can build pyramids but a ship is too much high science? Okay. Anyone else realise Egypt is coastal?" What kind of logical fallacy is this ? So the Egyptians can build pyramids but a ship is too much high science? Okay. Anyone else realise Egypt is coastal?" Thing 1 and thing 2 both share characteristic A. Therefore, things 1 and 2 are equal. The claimant here argues that building pyramids and boats are both high sciences and therefore equal, when in fact ship building is a very different operation than building pyramids. The assumption here is that a civilization capable of constructing a pyramid would also be capable of mastering shipbuilding that could withstand thousands of miles of ocean faring. The claimant then offers a non-sequitur /irrelevant thesis that Egypt is a coastal town. The fact that Egypt is coastal is irrelevant. While history proves many Mediterranean civilizations were capable of building ships and navigating the Mediterranean sea it does not logically follow they had mastered ocean-faring voyages as well. (Petitio principii) A fallacy that assumes what needs to be proven.